to have lost much of its initial enthusiasm. "Ukrainian politicians often disguise their pro-Western sentiments behind the rhetoric of friendship for Russia, talking eloquently about common bonds and historic destinies." 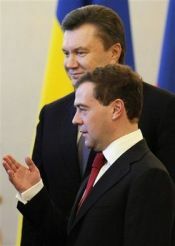 Russian President Dmitry Medvedev during a meeting with Ukrainian President Viktor Yanukovych at the Kremlin, March 5. All of the global media rushed to comment on the statement by Ukraine's new President during his first visit to Brussels. "Ukraine's relations with NATO will remain unchanged," President Viktor Yanukovych said on March 1. This will likely be followed by predictions about Ukraine's further progress toward NATO membership. And this has revived supporters of Ukrainian accession to the European Union, a prospect that was allegedly brought closer after the European Parliament adopted a resolution on the subject on the day Yanukovych was sworn in. In fact, the new president of Ukraine said nothing new while in Brussels. The drift toward NATO was declared the official strategic course of the country by ex-President Leonid Kuchma. True, it wasn't approved by the people in a national referendum, but by the Rada [Ukrainian parliament], which as always, was engaged in the process of creating all sorts of bind-boggling coalitions. Back then [2001-2005], the "Donetsk" faction decided to support "Westerners." Later, after the "Orange Revolution," the same Donetsk faction made the battle to keep NATO ships out of the Crimea the basis of its entire political campaign. This is the whole dynamic, which resembles a weather vane that pivots into the political wind. This doesn't involve a change in the dynamic itself, since pivoting is part of its very nature. But while the political wind may have changed, there are some facts that can't be. For example, Sevastopol as NATO's Black Sea base: this is an absurd and dangerous idea, fraught with potential conflict, misunderstandings and grudges. Sevastopol wouldn't fit into the structure of NATO any more than the Antonov Aircraft Design Bureau, which was set up in Moscow during the 1930s as a service center for training gliders. These are facts that cannot be changed by Leonid Kravchuk, Leonid Kuchma nor Viktor Yushchenko - and there's no reason to think they will under Yanukovych. Ukraine's integration into the E.U. is more complicated. All previous Ukrainian governments considered integration with the E.U. to be far more important that integration with the post-Soviet republics. That's why Ukrainian authorities established the post of Minister for European Integration, but no parallel post for developing a common economic space with Russia and the other CIS countries (primarily Belarus and Kazakhstan). Regardless of the frequency and destinations of their foreign visits, the policy of putting Brussels ahead of Moscow has been unfailingly pursued by every Ukrainian president. Which is why Yanukovych's scheduling of a visit to Brussels before one to Moscow shouldn't hold any symbolic meaning. 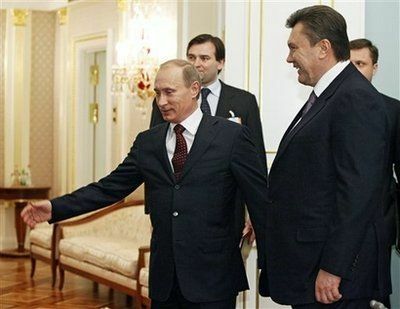 When former President Yushchenko took office in 2005, he went to Moscow first. But it was during his presidency that pro-Western policies in the country reached such absurd levels. Ukrainian politicians often disguise their pro-Western sentiments behind the rhetoric of friendship for Russia, talking eloquently about common bonds and historic destinies. Russia paid a very high price for taking Leonid Kuchma's rhetoric too seriously. And it's not just about providing Ukraine with cheap energy from Siberia. A whole range of important CIS initiatives, including the establishment of Economic Union, the Common Economic Space and others, were sabotaged by Ukrainian politicians who at first led Moscow to believe that Ukraine would join these alliances and then disrupted integration plans, citing either votes in the Rada, the sanctity of Ukraine's sovereignty, or other similar excuses. The fact that Yanukovych hasn't made a secret of prioritizing European integration may be for the better. We'll have no more false hopes. As for Ukraine's actual entry into the E.U., this is an issue for the very distant future. Lidia Kosikova, an expert on Ukraine at the Russian Academy of Sciences' Institute of Economy, believes that even Belarusia's economy is better prepared for a hypothetical entry into the E.U. than Ukraine. Objective Western analysts without "orange" illusions confirm her views. By the way, Russia has never opposed the Ukraine's integration into the E.U. In fact it was the E.U. that seemed jealous when it demanded Ukraine leave the Eurasian Economic Community if it wanted to integrate into Europe. However, the prohibitions and promises of European officials have rarely been backed up with money. Now European Commission President Jose Manuel Barroso has offered Ukraine a loan of no more than €500 million for "good behavior." Meanwhile, Ukraine's 2010 state budget, if it's ever adopted, will run a deficit of at least €10 billion. Manufacturing in the country shrank by 21 percent last year, and the social obligations made the government in the heat of an election race will be virtually impossible to meet. Only Russia can help Ukraine out of this situation. So we must be ready for more friendship talk from Yanukovych. In fact, he may do no worse with us than he did in Brussels with Western politicians and journalists, who only recently referred to him as the "Kremlin's puppet," the "kidnapper-in-chief of ballots" and a "twice-convicted violent felon."